As you have probably noticed, I am a huge fan of Patricia Wells and her recipes. I am still dreaming of her cherry almond tart that I baked a few weeks ago. When P and I first lived together in an adorable garden cottage in Kensington, we cooked from Trattoria more than any other source. With Wells' recipes, we christened our newly acquired domestic tools: knives, dishes, and pots and pans. 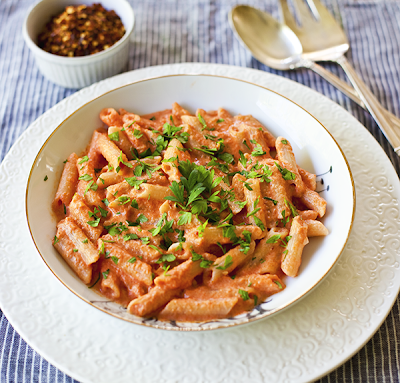 Penne with Vodka Tomato Cream Sauce became a staple item - it is easy to make and comforting to eat. Wells can make even a novice cook feel like a pro. My mom's Bolinas garden is lush with edibles these days. Her green thumb helps produce veggies that are vigorous and delicious. She sent me home with bounty from her first garlic harvest. 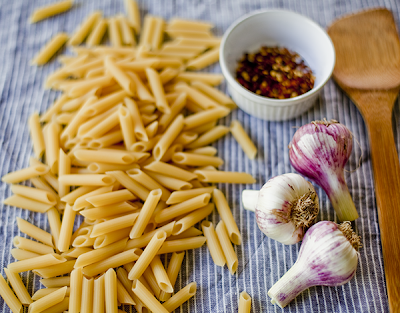 The cloves went right into this pasta dish. And I harvested just enough parsley in our own garden to use. The rest has beautifully gone to seed. I ended up throwing some parsley blossoms on top of the leftover pasta and they were wonderfully peppery. 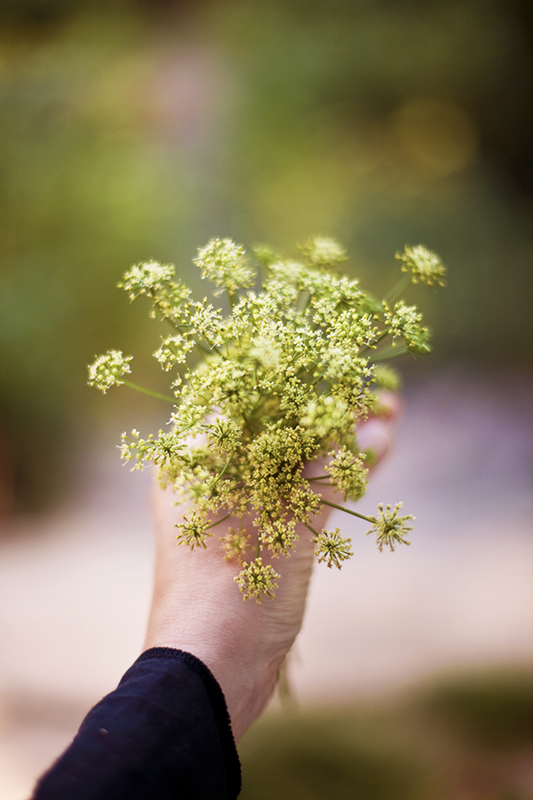 If your own parsley has gone to seed, give the blossoms a try. Note: I've found that this dish can be made ahead of time and reheated covered for about 15-20 minutes in a 350 degree oven. I think I even prefer the baked version to the freshly made dish. Yum! Set a large pot of water to boil for the pasta. Salt water until it tastes like the sea. Place garlic, olive oil, red pepper flakes, and a generous pinch of salt in an unheated large saute pan. 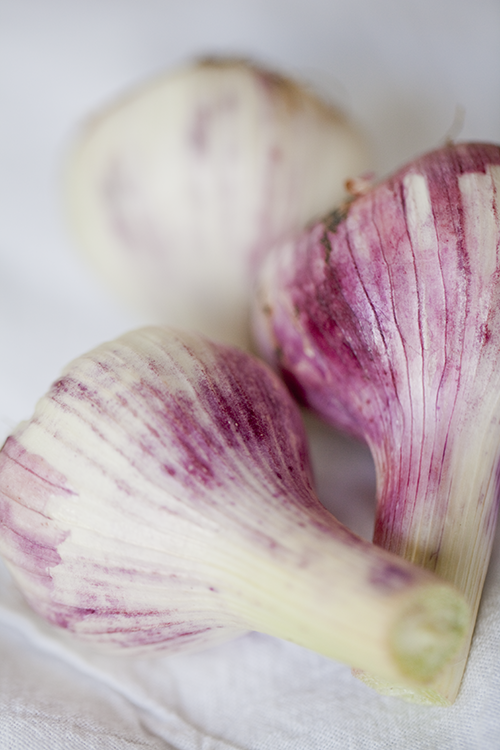 Turn heat to medium and cook for a few minutes until garlic is golden but not at all crispy. Stir in tomato puree. Simmer for about 15 minutes and sauce has thickened. In the meantime cook Penne. Add cooked pasta to the now thickened sauce in the large saute pan. Stir pasta to coat with sauce. Add Vodka and stir again. Add Cream and stir again. Cover pan and turn heat down to low. Let sit for a couple of minutes before serving. Season again with salt to taste. Serve topped with fresh chopped parsley and/or parsley flowers. It's great to know there is a use for the blossoms that suddenly appeared on my parsley plant! I have never seen them used in a recipe before. This looks like a delicious summer meal. I really was happy to discover how delicious the parsley blossoms were. They somehow seemed made for this pasta. Who knew! This is sounds like an easy yummy supper, I already have a whole list of recipes from you to try and this will be another one :) maybe even this Sunday. Beautiful photos and first one is such a gorgeous shot! Oh this looks sinfully amazing. I love how simple the recipe is. This is practically a pantry dish. I almost always have all of these ingredients--even the heavy cream, which if I wanted I could always replace with half&half. And who knew parsley blossomed such pretty, delicate looking flowers. Love! Adrianna, so true about this being a "pantry dish." I love such simple recipes that taste so good! M, pancetta and basil sound like yummy additions. I'm glad you liked the sauce:) So damned easy, right? I've never made vodka tomato sauce although I've heard so much about it. Yours looks wonderful. Bookmarked for later. I've added your link to my page by the way. Couldn't resist. Love your stuff. The penne really looks delicious! Totally something that I would make for dinner, and save some leftovers for work the next morning. I'm going to have to put it on my list to try soon. Today I plan to make a Low Fat Tomato Pasta Salad. I hope it's tasty. Thanks for sharing your recipe! I made this for dinner again, and I'm back to tell you how much we loved it, again...added some spicy Italian sausage to it...yum! I made this for dinner tonight, I did not think it had enough flavor! Anonymous, sorry to hear that you weren't happy with Patricia Well's recipe - it is still one of my favorites. One thought....adding just the right salt to your taste can make all the difference.